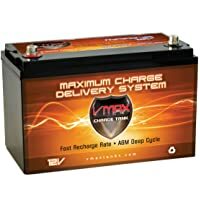 This battery from VMAXTANKS is a very strong deep cycle marine battery with dimensions 13 inches by 6.8 inches by 8.8 inches and weight of around 75 pounds. With HCA of 1740 A and MCA of 900 A, this battery has been specially designed for heavy duty deep cycle applications. To add up its versatility, this battery has AGM based electrolyte suspension technology, which makes it a free of maintenance and precisely reliable battery. The reserve capacity of this battery is 230 minutes, which makes it a high performing deep cycle marine battery. Heavy duty 12 volts deep cycle battery, widely applicable for deep cycle use. It belongs to group 31, quite a large size but with portable weight. Hot cranking amps of 1740 A and Marine cranking Amps of 900. Capacity of 120 AH and reserve capacity of 230 minutes makes it capable of powering up the appliances for very long period. Great charge acceptance and faster recharging capability. Low self discharge rate of around 1% to 2% per month. Low internal resistance allows the battery to withstand more deep discharges and recharges. Absorbed glass mate technology makes the battery 100% maintenance free. Perfectly sealed container prevents spilling and leaking of any harmful gas or fumes. Heavy duty grids that are made from custom built military grade lead-tin alloys. It can be charged with AGM smart charger of microprocessor controlled charger with voltage of 14 V to 15 V in constant current supply. Stainless steel SAE top and post that prevents corrosion of the terminals and it also allows easy connections without any wiring issue. Resistant to heavy vibrations, heat and it can withstand any weather condition. Very long service life of 8 to 10 years if cared and used properly. The Vmaxtanks MR137 is a deep cycle marine battery and it is designed to be used for deep cycle applications like powering up onboard appliances such as trolling motors and other accessories that require heavy power load. This marine battery is best for producing thrust on 55 lb to 110 lb Minn Kota, cobra, Newport vessels, sevylor and other trolling motors of that weight and for those marine enthusiasts who want a 12 volts group 31 deep cycle battery for their work or hobby. This battery is a very powerful unit and can be used even for off marine use. The Vmaxtanks MR137 is the most powerful deep cycle battery produced by the VMAXTANKS. With power voltage of 12 volts and 120 amp hour rating, it is able to provide massive deep cycle power than any other standard marine battery in its class. Due to the heavy duty lead-tin alloy grids, this battery is capable of high performance, very long float life and long duration even in cyclic operations. The AGM or absorbed glass mate technology ensures maintenance free operations such as no requirement of routine electrolyte gravity check and refilling of distilled water because of the recombinant technology within the battery. The battery can continuously run for 4 to 7 hours without being recharged for a long time. The battery has been sealed in a way that the battery is not only resistant to vibrations and shocks but it is also spill proof, which makes the battery flexible to any mounting position without really causing damage to the battery or hampering the battery service life. This battery can withstand the harshest climatic conditions and it can bear extreme hot as well as cold temperature. The container of the battery is flame proof rugged and extremely strong; so one can care freely rely on this battery. The Vmaxtanks MR137 deep cycle battery is specially designed for 55 lb to 110 lb trolling motors and in case it is used for thrusting lighter trolling motors then it might be too powerful. For the lighter ones you can go for Vmaxtanks MR107 or VMAX857, both of which are also deep cycle AGM marine batteries but designed for the trolling motors with lighter weight. As it is an AGM battery, there is a risk of overcharging, so extra care must be taken while charging it. This deep cycle marine battery is a very strong, durable and reliable battery with so many tempting features. If you need a battery with the above parameters, then nothing can be as good as this battery and it is also available in a very affordable price.